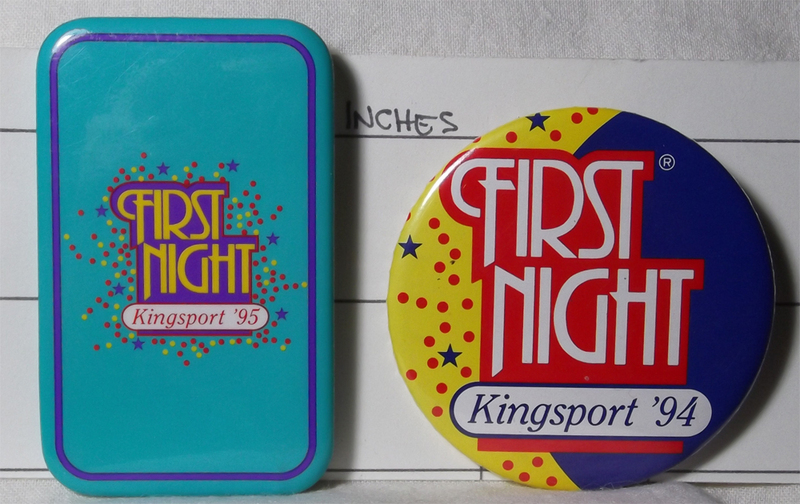 First Night, a project of Kingsport Tomorrow, was a deal back in the 90s. On New Year’s Eve, there were tents around the downtown area, with music and dancing, all with people as sober as all get out. I was elsewhere, but we did watch the fireworks at midnight. This entry was posted in Bob's photos and tagged First Night Kingsport TN, Kingsport Tomorrow on October 16, 2016 by Bob Lawrence. Grubby, but unbowed. It’s kind of difficult to date this money bag. The downtown drive-in branch closed sometime in the 60s, maybe early 70s. 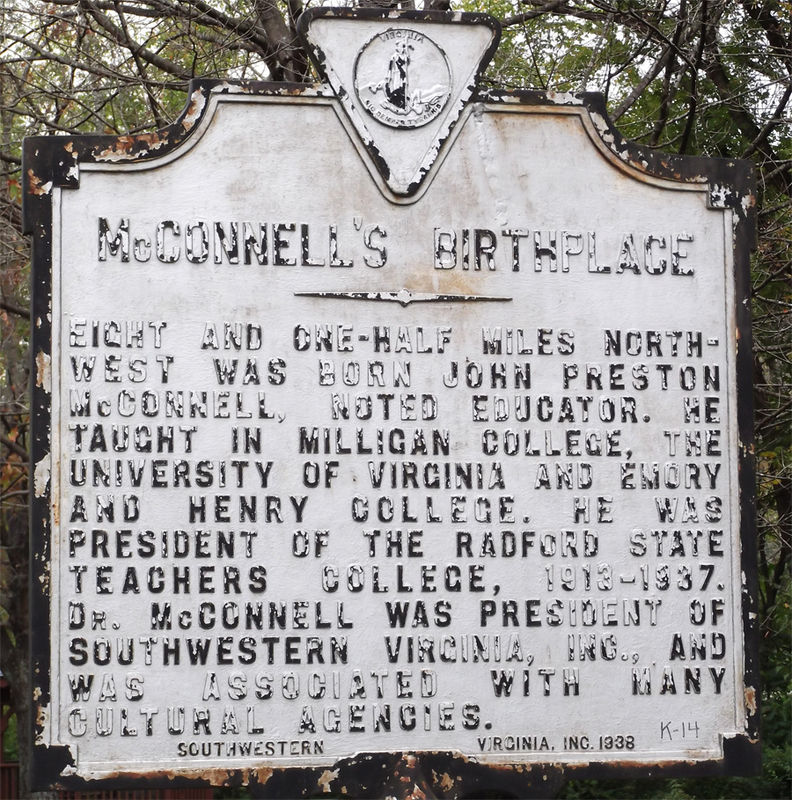 It was on the corner of Clay and New Streets, across from where Chef’s Pizza is now. You can still see the traffic direction arrows for the drive-in lanes sunk into the concrete (they were originally filled with yellow concrete, but it’s mostly eroded away). Storied history of this bank: established in 1916, as you can see. J. Fred Johnson was a VP in ’23 and President by 1931. 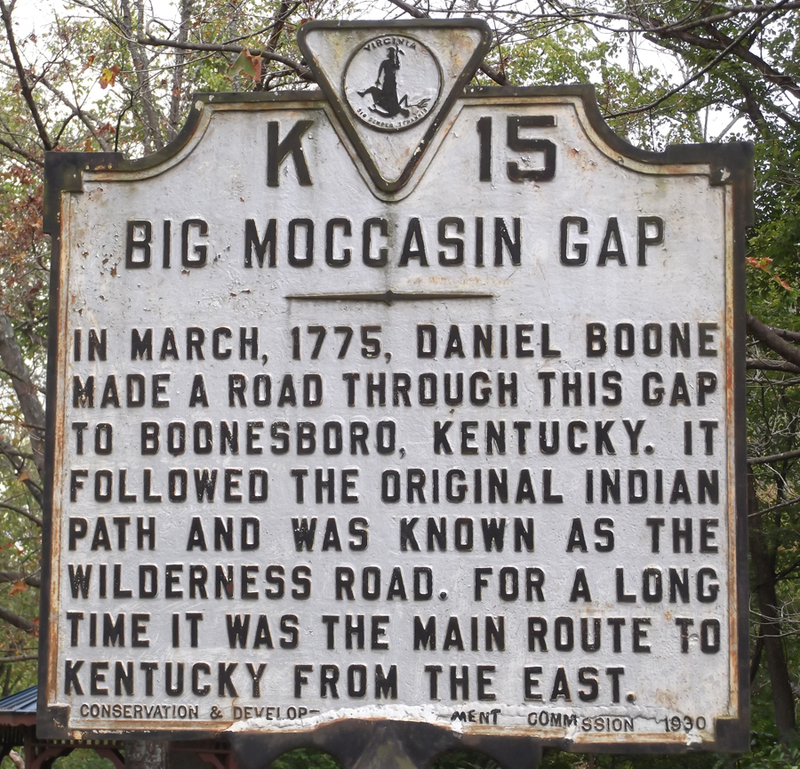 In 1963, First NB of Kingsport and First NB of Bristol merged and sometime later the group became First NB of Sullivan County. In 1981, it became First Eastern NB; in 1982, it was First American Bank-Eastern and on and on It might be Regions Bank now. The bag is 10.5″ x 6″. It really could do with a good washing, but that’s not going to happen. HIstoric integrity and all that. 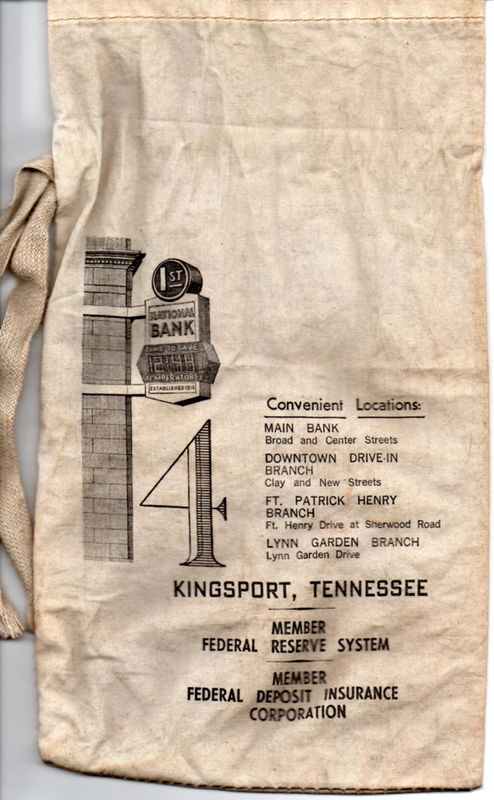 This entry was posted in Bob's photos and tagged Bob Lawrence photo, First Eastern NB, First National Bank of Bristol, First National Bank of Kingsport, J. Fred Johnson, Kingsport TN, Regions Bank on October 6, 2016 by Bob Lawrence. 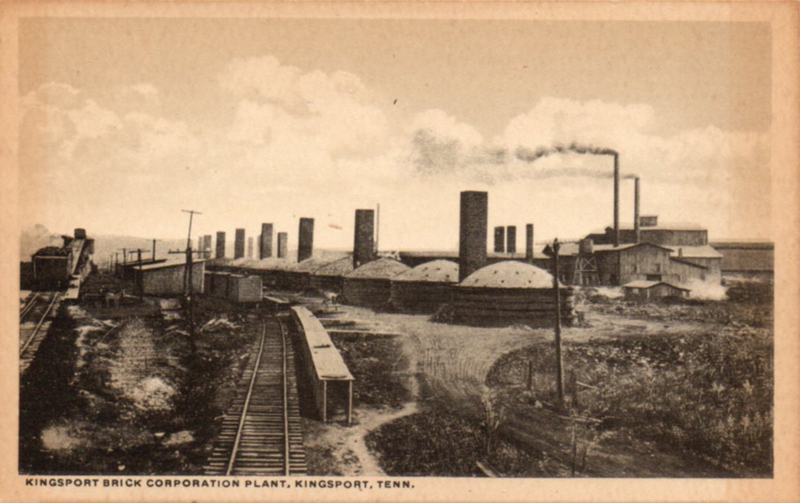 This is a Kingsport Drug Store postcard, printed by Curt Teich (Doubletone) in Chicago, around 1916 (printer’s inventory number/plate number is AD-7661). I think the picture was taken from the roof of Citizens Supply building, or while dangling from an electrical line, take your pick; although, come to think of it, I’ve seen a reference to some sort of signalling or lighting structure built over the tracks there…I don’t know.) 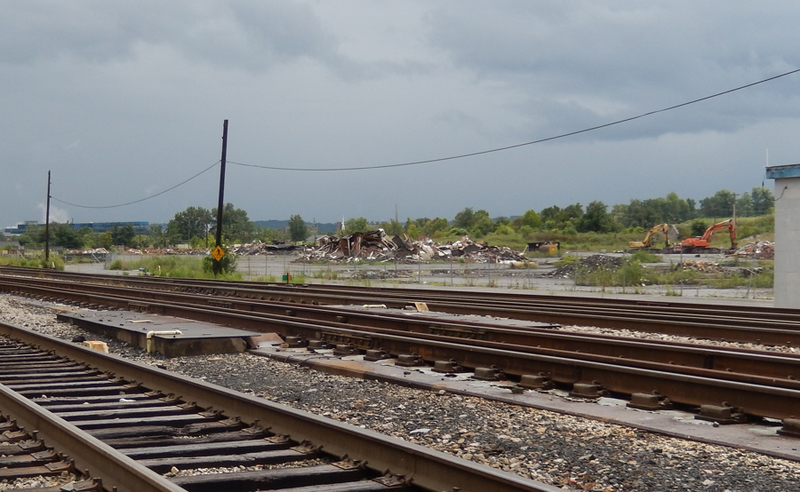 The conical buildings are kilns which were knocked down decades ago. The back buildings served other parts of the brick making process. They were mostly extant until a few years ago. The graffitti was dense in and around them. And the ground was, basically, one big layer of broken bricks. I took a lot of pictures over there, until, about three years ago, a policeman courteously asked me to leave, since it was private property. This entry was posted in Bob's photos and tagged Curt Teich Doubletone, General Shale Company, Kingsport Brick Company, Kingsport Drug Store, Kingsport TN on October 5, 2016 by Bob Lawrence. Not a forest, exactly, but a group of six markers on the right after you pass the red light at Wadlow Gap Road and head toward Gate City . For some reason or other, I never seemed to have the time or the inclination to stop the check them out. Today, I did. 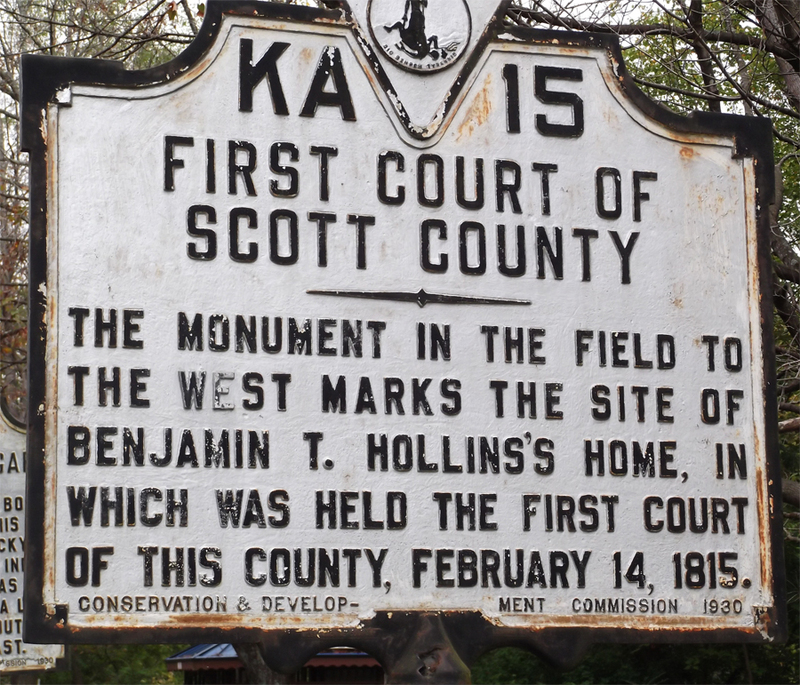 This marble marker commemorates the first court of Scott County which was held on this site in 1815. 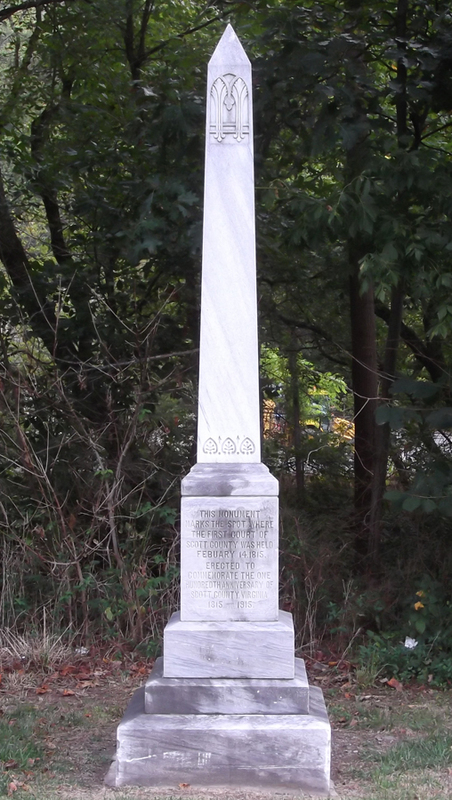 The marker was placed here in 1915. Just a bit back toward Weber City, you can see the remnants of the bridge over Big Moccasin Creek where you would turn to take the road up to Hiltons. 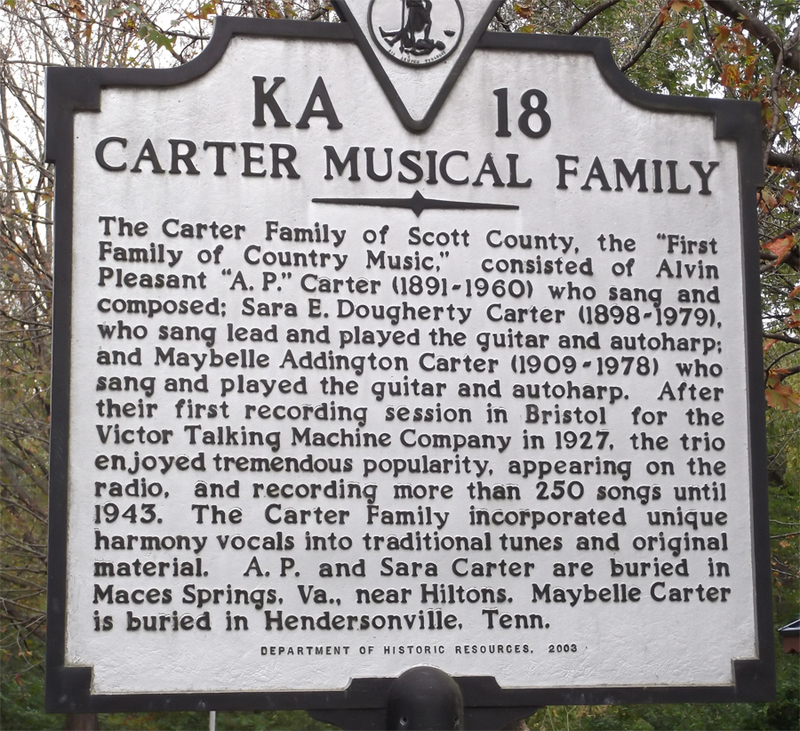 This entry was posted in Bob's photos and tagged Big Mocassin Gap Creek, carter music family, first court of Scott County VA, gate city va, historic markers, john donelson's line, scott co va, weber city va on October 1, 2016 by Bob Lawrence. 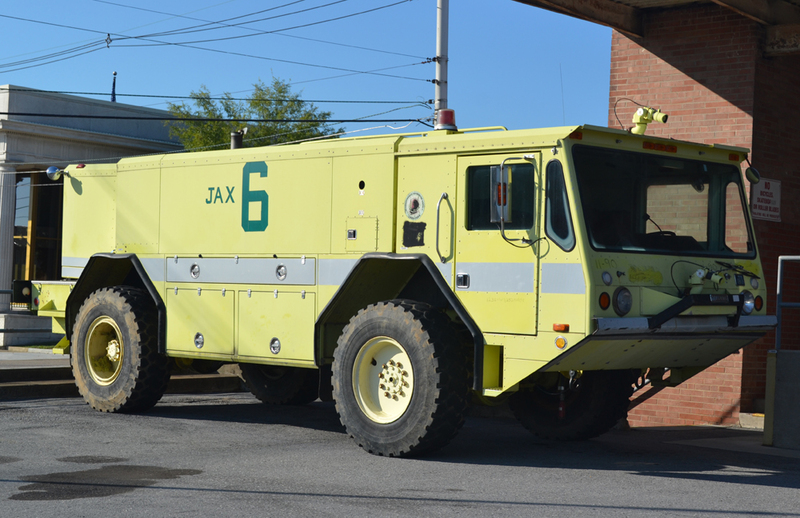 I think this is a retired piece of firefighting equipment from Jacksonville International Airport. And it’s parked behind the Post Office downtown. That’s interesting, kind of. This entry was posted in Bob's photos and tagged Jacksonville International Airport on September 30, 2016 by Bob Lawrence. Remember this? 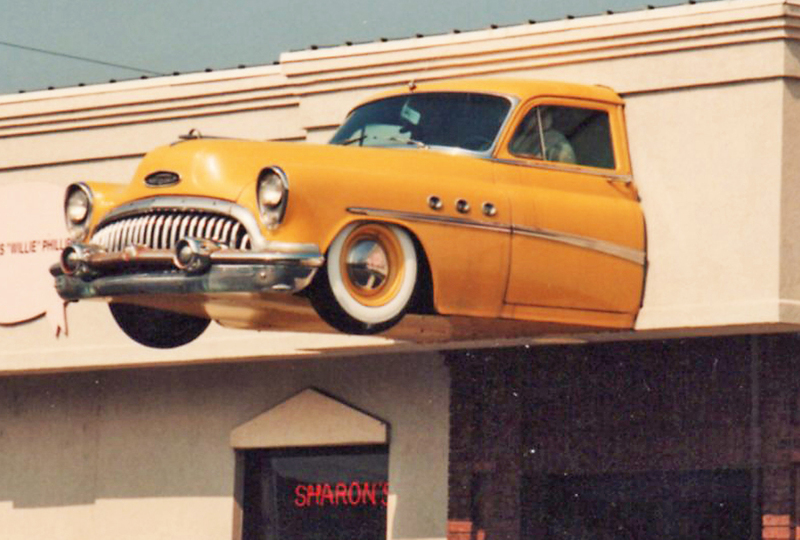 The 1953, or thereabouts, Buick that protruded over the door of Sharon’s Barbecue restaurant, where Southern Smoke is now, across from the Post Office. The chicken is driving and the pig’s in the passenger seat. Zoom, Zoom. This entry was posted in Bob's photos and tagged 1953 Buick, Sharon's Barbecue Kingsport TN on September 29, 2016 by Bob Lawrence. 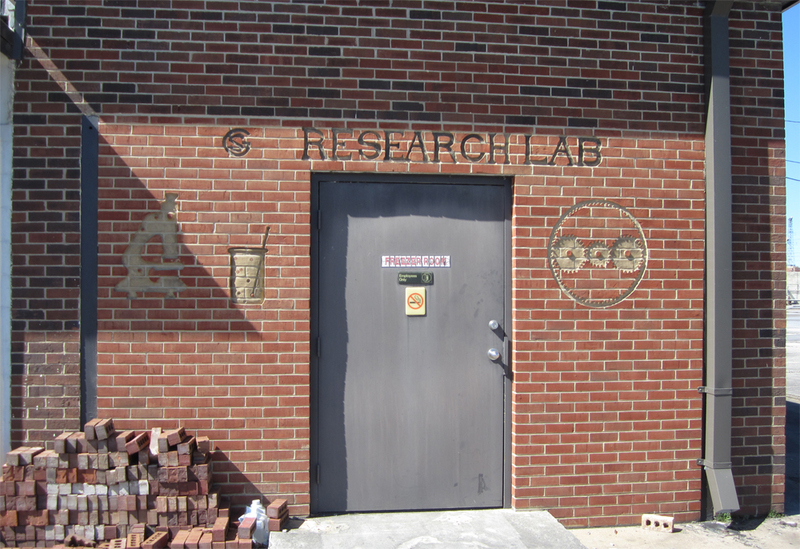 This was the Research Lab at General Shale Brick Plant. I always wondered what they got up to in there. It’s gone now, but I guess I ran, walked or rode a bike past it a hundred times over the years. 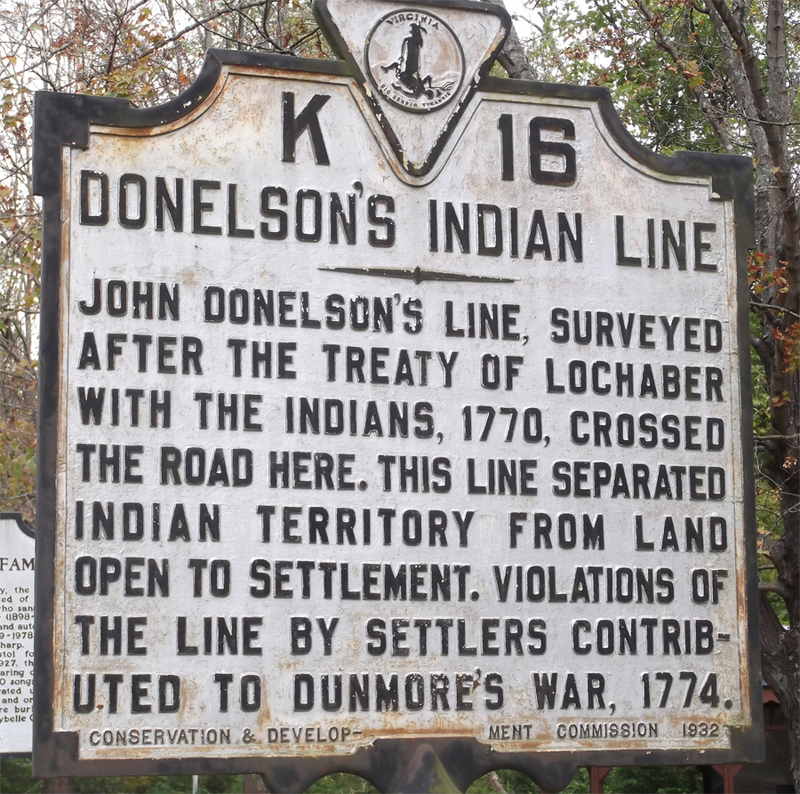 It was on the road through GS that connected Cherokee Street to Industry Drive (there was going to be an extension of Cherokee Street directly to Industry Drive, but it was never really completed. I walked it a couple of times – it came out on Industry Drive beside that abandoned brick power station). Clever clogs, these research guys. Look at the designs in the brickwork. The one on the right does kind of look like the ABC TV logo, doesn’t it? This entry was posted in Bob's photos and tagged General Shale Brick Plant Kingsport TN, Research Lab on September 21, 2016 by Bob Lawrence.